Azza is a bilingual Special Needs Educator who has been working with children for 8 years. She obtained her Bachelor’s Degree in Psychology from Ain Shams University in Cairo, Egypt. She has also received extensive training in Speech and language, ABA (Applied Behavior Analysis) and Language Development. 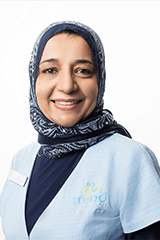 Azza is a patient, hard-working and dedicated Educator who thrives on the progress and improvement of the children entrusted to her. Her points of strength are in establishing rapport with children, setting a stimulating teaching environment to help children integrate and manage challenging behavior, set effective IEP (Individual Educational Plan), group plans and monitor their progress, and train and guide parents to contribute in their children’s program.